Official artwork of a various Nintendogs. The Nintendog (ニンテンドッグ, Nintendog) appears in the Nintendogs series of games. The franchise was originally conceived by Shigeru Miyamoto, and is now one of the most successful series of games on the Nintendo DS handheld system. In this simulation title, the player takes the role of a dog owner and uses the various capabilities of the DS to look after their chosen puppies. They can walk them to several different locations, buy them different types of essentials and train them for competitions. A Nintendog as it appears in Nintendogs. The Nintendog first appeared in the DS game Nintendogs. This breed of Nintendog is from the Labrador & Friends version of Nintendogs. Nintendogs is a real-time simulation on taking care and playing with puppies. When a player turns on the game, the puppies that the player bought will "greet" the person by jumping in front of the camera and barking. The Nintendogs also do this when the player pushes the "Call Dogs" button, or by calling or whistling for the Nintendog in the DS microphone. In Brawl and SSB4, a Nintendog appears on the stage for a short period of time. The Nintendog then jumps in front of the camera in a similar fashion to how they did in the Nintendogs games. The SSB4 version of the Nintendog is more in line with its design used in nintendogs + cats. The Nintendog after being unleashed. 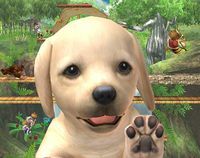 The Nintendog appears in Super Smash Bros. Brawl. It was first seen in the trailer at E3 2006 and was believed to be an item of its own. However, much later it was confirmed to be an Assist Trophy. Upon being summoned, the Nintendog comes up to the screen and prevents players from easily viewing the battlefield and their own characters; in addition to potentially staying still and staring at the player, the Nintendog can also paw at the screen, dynamically altering visibility of gameplay. Names and other tags are also disabled and CPU characters that are covered by the Nintendog do not do anything until the incursion subsides. The puppy will always bark twice at the bottom left corner of the screen before leaving. 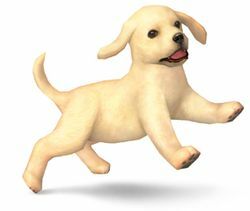 The Nintendog featured in Brawl is a Labrador Retriever. Game director Masahiro Sakurai stated in the update on the Smash Bros DOJO!! that he chose the breed because of its popularity in many regions of the world. The Nintendog trophy in Brawl. A puppy for you to train on your Nintendo DS. They come in a wide variety of breeds, colors, coat styles, and personalities. You can train them, use dog toys to play with them, and feed them treats to establish a real link with your virtual pet. Other features include the ability to enter your dog in disc-catching contests and agility trials on obstacle courses. Note the Nintendog in the background. Several species of Nintendogs appear in the background of the Living Room in Super Smash Bros. for Nintendo 3DS. They are a Toy Poodle, a Shiba Inu, a Beagle, a Jack Russel, and a Golden Retrievers. The version of Nintendog that appears in Super Smash Bros. 4. The Nintendog Assist Trophy also retains its role from Brawl, disrupting visibility of the game. 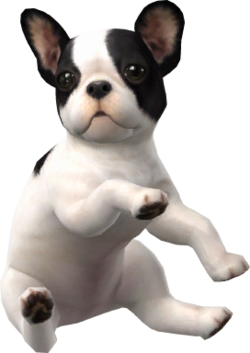 The Assist Trophy is in this game a French Bulldog. The Nintendog needs to land on the ground before it can block the screen. Otherwise, it will despawn upon crossing a blast line. Nintendog's trophy appears in both versions. In Super Smash Bros. for Wii U it is part of the Nintendo DS and Nintendo 3DS Trophy Box. Trophy in for Wii U. This is one of the many adorable dogs you can care for in Nintendogs + Cats. It's hard for them to wag their little tails, but they make up for it with that cute face. In Smash Bros., they want to get right up in your face, blocking your view of the battle. They just want to be loved! 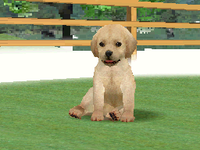 This is one of the many adorable dogs you can take care of in Nintendogs + Cats. They aren't big tail-waggers, but they have the cutest little faces. In this game, one might come right up to the screen and block your view! It just wants to play, so don't get annoyed, OK? Trophies of other Nintendog breeds appear exclusively in Super Smash Bros. for Nintendo 3DS. Those adorable eyes and curly hair may remind people of teddy bears more easily than dogs. But unlike a stuffed animal, these dogs are active and love to play. One reason the dogs are so popular is that they are quite easy to train. They appear in Toy Poodle & New Friends. Their adorable eyes and curly hair make them look almost like teddy bears! Unlike stuffed animals, though, these dogs don't sit still. They're active, highly curious and love to play with people. One of the main reasons they're so popular is because they're easy to train. You can pick this breed in Toy Podle & New Friends. The Shiba is one of the oldest breeds in the world. These Japanese dogs can be very loyal, and in the past their agility and active nature proved useful to their owners on hunting trips. You can look after and train one of these dogs in Golden Retriever & New Friends. The Shiba is one of the oldest breeds in the world. These Japanese dogs can be very loyal, and in the past, their agility and active nature was useful to their owners on hunting trips. You can look after and train one of these dogs in Golden Retriever & New Friends. Hunting wild rabbits used to be a popular sport in England, and the beagle, an active and playful breed, was a popular companion for it. Perhaps sleeping beagles nowadays dream of chasing rabbits like their ancestors. You can choose this breed in Golden Retriever & New Friends. Hunting wild rabbits used to be a popular sport in England and the beagle was a popular companion for it. Known for its distinctive voice, the beagle is quite active and playful. Perhaps sleeping beagles nowadays dream of chasing rabbits like their ancestors. You can choose this breed in Golden Retriever & New Friends. This breed originated in England and is especially good at chasing foxes. With no foxes in the living room, though, it'll chase toys instead. Terriers are tough, athletic, and curious—a perfect fit for someone who is the same! You can choose this breed in Toy Poodle & New Friends. This breed from the British Isles loves chasing small animals. If there aren't any in your living room, they'll just chase toys instead: balls, Mario karts - whatever's lying around. They're tough, athletic and highly curious. If that also sounds like you, maybe you'd be a good match! Take care of one in Toy Poodle & New Friends. This large breed was originally from Scotland and was used to hunt waterfowl. They're smart but way too friendly to make good guard dogs. They come in a variety of shades, but all members of the breed share the golden color. This breed is included in Golden Retriever & New Friends. This large breed from Scotland used to hunt waterfowl. They're intelligent, but a tad too friendly to be good guard dogs. With them all being the same colour, one Golden Retriever might look like the next, but in Nintendogs + Cats, no two dogs are the same on the inside. You can take care of one in Golden Retriever & New Friends. The Nintendog with Duck Hunt. 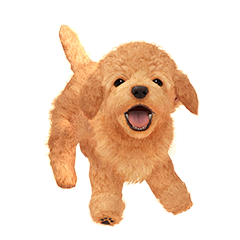 The Nintendog returns as an Assist Trophy yet again. This time, the dog is a Toy Poodle. Each breed that had been used for the Assist Trophy appear as Spirits. Additionally, the other breeds reprise their roles for the Living Room. Occasionally, pausing the game in Brawl while the Nintendog is on the screen will instantly cause it to leave. In SSB4, while Nintendog will still appear in front of the screen when paused, moving the camera will cause it to be missing at every angle and zoom. This page was last edited on March 11, 2019, at 23:24.